It's that time of year again--Astronomy Festival! This is the seventh annual event at Great Basin National Park, going from Thursday, September 29 through Saturday, October 1. After school on Thursday we drove up to the park and visited the solar bracelet table. The solar beads turn color when they're out in the sun. We also picked up a copy of the new Junior Ranger Night Explorer booklet. It looks like lots of fun! Desert Girl shows off her bracelet. And her new haircut! Then we went to a talk about how to use planispheres. We all learned something new. The sun peeked out from the clouds, so we used the solar viewing glasses to take a look. Then the kids got distracted by picking up and eating pine nuts. They sure are tasty! We returned in the evening for the ranger talent show. It's always a lot of fun, and I volunteereed to play my trumpet. I thought the theme to the classic Star Trek movie would be a fun song to play. I didn't get a photo of myself, but here are some of the other performers. First up, the Front Porch Pickers, who generally play every Friday night on---are you ready for this? ?---the front porch! Then it was time to head down to the picnic area to look through the telescopes. About ten big telescopes were set up, checking out globular clusters M13 (in Hercules) and M22 (in Sagittarius), a binary star system, the rings of Saturn, the Ring Nebula, and more. I overheard someone asking what the Milky Way was, as he had never seen "that cloudy thing" up in the sky. It made me realize how much we take our night skies for granted, living way out in the boonies. Only a couple hundred years ago, everyone saw night skies like this, but in the last couple centuries, light pollution has made it so that people in cities or near cities can't see the wonders beyond our little orb. You'd think we, as intelligent beings, would be able to fix this quickly. The kids were eager to earn their Milky Way candy bars for looking through telescopes and learning more about the night sky. It was a school night, so we couldn't stay too long. The festival goes on for two more days, with lots of events! Last week on the first day of fall, we had a storm, the first storm in a long time (the monsoons kind of skipped us this year). I was doing a kid exchange and was up in Great Basin National Park when we saw a truck stopped at the bottom of the Wheeler Peak Scenic Drive with snow on it. I pointed it out to the kids and asked if they wanted to go check out the snow. Desert Boy wasn't too enthusiastic, but Desert Girl thought it was a great idea. So we headed uphill and drove up to about 9,000 feet and started seeing snow on the trees above us. Fortunately not many other people wanted to drive up into the storm, so we could stop frequently and take lots of photos. The fall colors were glorious, with many hues of yellows and oranges, and reds. A little past 9,200 feet we reached our first snow. It was obvious that it had come down with some wind. Desert Girl put on a sweatshirt and went out to experience it. Then she came after me with a snowball! We kept going up, and the sun peeked out, showing snow-dusted mountains and limber pine silhouettes. I'm sure my pulse rate was up, I was so excited to be there, seeing this gorgeous scenery right in the moment. I had thought that the wind might have knocked down many of the leaves, but they held on, now coated with a layer of white that made the fall colors even more vibrant. The road was wet, but not slick. And I kept stopping to take more photos! The one below was one of my favorites. At one stop, I caught Desert Girl eating some snow. The snow balanced precariously on the leaves, some of it falling with each wind gust. The fast moving clouds revealed some blue sky from time to time. And I couldn't help but try for some artsy photos. The scene at the Wheeler Peak summit trailhead was dramatic, with the trees drooping from the snow. No one was hiking the trail. We could barely even see the mountains from there due to the clouds. It probably wouldn't have been that scenic of a hike, as you would be in the clouds most of the time. We drove on to the Wheeler Peak campground, which was also coated in snow. We drove through to see if there were any campers. We stopped at a campsite I've been wanting to camp at and found that the wind had knocked off more of the leaves here. As for campers? We didn't see any. Heading back down, I still wasn't tired of taking photos. The mix of colors was entrancing. And then we had some frosted vegetation and late afternoon shadows. The view from Mather Overlook was a bit muted. That spur-of-the-moment drive has to be one of the most beautiful drives I've ever taken. It was just magical. And the photos will let me remember it even longer. I sure was glad I had my good camera with me! Hope you've enjoyed this eye candy. There are still lots of great fall colors and photogenic moments out there! I left my part of the Great Basin and went to the very edge of the Basin and Range province to Lava Beds National Monument for over a week in mid-September to teach a cave rescue class for the National Cave Rescue Commission (NCRC). Every year the NCRC hosts a national seminar with a variety of classes. This year it was in Mentone, Alabama, but due to other obligations, I wasn't able to go. I was approached about teaching a Level 1 seminar at Lava Beds, and it all worked out, so I set out. Even though I spent eight days there, I managed to get very few photos (at least by my usual standards). I didn't even get one of the entrance sign. The first day I arrived I was very intent in trying to figure out what caves we'd be using for the rest of the week. Above is Ron in the culvert for one of the caves, one we ended up using for the mock rescue at the end of the week. It was a difficult entrance to negotiate. On Saturday we started with classes in Lava Bed's fire conference room. But this is a cave rescue class, so why not do the Cave Environment underground in Mushpot Cave? The park uses the cave for school group presentations. We stuck around long enough for the Hypothermia lecture, which the 50 degree temperature made us feel a little bit more. A big part of Level 1 is patient packaging. We need to know how to keep a patient warm in a litter and tied in securely, no matter which way the litter is being moved. By Day 3, we were ready to head out to some short cliffs and practice moving the litters up and down. We had a station for using the Ferno, our Cadillac of cave litters, and another station for the Sked, which looks like an orange burrito but can fit in tiny spots. We used a pike-and-pivot technique to solve the edge problem. After the exercises, some of the class went to the bottom of Skull Cave, which is one of 18 caves in Lava Beds that still has ice in them. Twelve others used to in recent history, but that ice has since melted. There are a whopping 700+ caves at Lava Beds! Our evenings were largely consumed with doing check-offs, which is when the students show the instructors that they know the skills we've been practicing in class. Below is the comm station, where students hook up old military phones to comm wire and talk to each other. Day 4 we went into Sentinel Cave to practice a variety of techniques, such as searching for patients, running comm line and operating field phones, anchoring, and doing some hauls and lowers in the lava tubes. Below, Tom knew how to make an entrance on an upper level, with the class below him. It wasn't a very big drop, but big enough to practice setting up a mainline and belay and finding anchors that wouldn't move. In another station, students found their own anchors, then attached a rope and rappelled down it. Over ten different anchors were used, which was pretty creative. We all celebrated when Checkoffs were completed! Bill provided entertainment. After a written test it was time for the mock walkthrough. We used Catacombs, a particularly mazy cave along the cave loop. Lava Beds has over 20 caves open to the public, many with staircases or ladders that descend down into the lava tubes. Then you can walk--or crawl--wherever you like. It's a cool experience. The mock walkthrough is an exercise in how to run a cave rescue incident. Eddy's a pro at it, and we did five iterations so students could rotate through various positions and try out different roles in a rescue. There were some humorous moments, like when the medic decided he better clear the airway of the drunken patient who was pretending to throw up. The medic was prepared with his glove. Oh, what we do for fun in cave rescue! After several hours of practice, we packed everything up and headed back to the vehicles. It was time to get ready for the mock rescue the next day, which would start at 8 am and go all day. The scenario was that a park employee took two others caving in a cave we hadn't visited all week. When they got to the bottom gate, it wouldn't open. One person got injured with a broken lower leg. The other two went back through to get help. One got hit in the head with a rock and was unconscious up on top of a drop. The other was wandering around, lost and hypothermic. In came the rescuers, who had to employ all sorts of strategies to get all three out. We were in the cave so long that we had to use pee bottles, as it is not at all kosher to pee in a cave. There's no rain to wash the pee away, little wind to scatter the smell. Gatorade bottles are commonly used, but one must be very careful not to confuse a lemon lime with a pee bottle (it's been done more than once before!). This cave rescuer carefully marked the caps with skulls and crossbones and put duct tape around one bottle that said "Hydrate or die!" Twenty-one students finished the intensive 7-day course, with up to 14 hours a day of instruction. 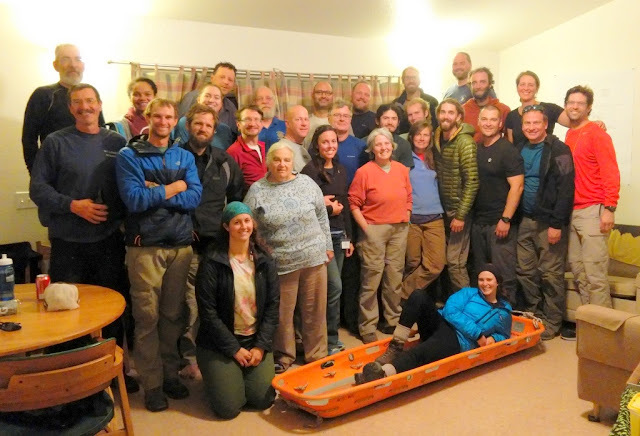 Thanks to Lava Beds for hosting, all the instructors who volunteered their time, the staff who kept paperwork in order and cooked meals for us, and all the students! If this sounds like something you'd be interested in, check out the NCRC website for upcoming classes. Next year's nationals will be near Bend, OR from June 17-24.